Pro Audio Systems recently completed the installation of a custom-engineered audio / visual solution into two separate locations within the Mirfield Free Grammar Sports Centre. 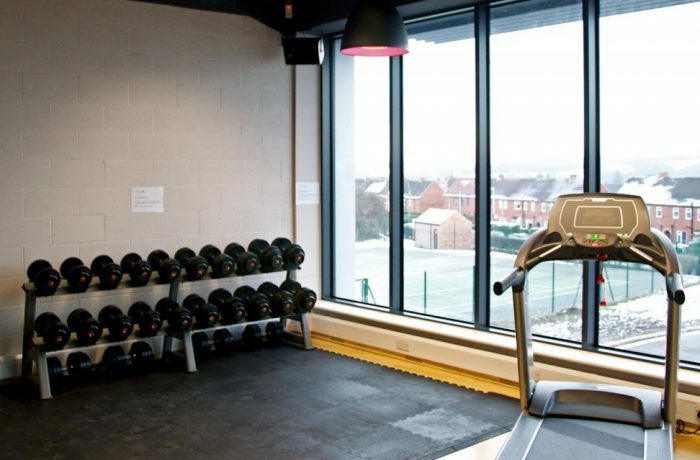 Attached to the Mirfield Free Grammar School (whose alumni include Sir Patrick Stewart), the Sports Centre opened in January 2013 and represents a £1.5m investment in leading edge sports facilities, not only for students but also for local people. A variety of facilities are available within the centre, including all-weather pitches, sports halls, a well-equipped gym and a dance studio. Our brief was to install systems that could provide quality audio reproduction at appropriate sound pressure levels (which are substantial, especially in the dance studio), which were reliable, simple to operate and which also had to meet reasonably strict budgetary constraints. Pro Audio Systems designed and installed separate audio systems for the gym and the dance studio, using Tannoy VX6B and VX12B loudspeakers respectively. Two separate playback and control racks were constructed, reflecting the different uses of each location – in the gym the rack contains an Apple TV device, a Cloud CX261 zone mixer and a Crest CPX1500 amplifier to drive the Tannoy loudspeakers. All playback content for the gym is derived from the Apple TV with a 22” screen also installed by Pro Audio Systems to monitor the Apple TV. In the dance studio a somewhat larger rack is required to house a variety of playback devices. The audio signals from a Tascam CD200i CD Player (with integral iPod dock), a Blu-Ray player and another Apple TV device (which streams music from a local server) are all routed via a Cloud CX261 Mixer to a Crest CPX2600 Amp and thence to the loudspeakers. The CD element of the Tascam is primarily a backup as most material is brought in to the facility on iPods which are then connected using the iPod dock. The infrastructure in the Dance Studio is also compatible with iTunes Match, a subscription service that allows music (whether bought from iTunes or elsewhere, or imported from CDs) to be stored in iCloud and then accessed remotely from anywhere using an Apple iOS device. This eliminates device storage limitations and means that, for example, an instructor could use their iPhone to access their own music collection and play it back through the system. Another screen, supplied by the client, was also installed in the dance studio that displays visual content from both the Blu-Ray and Apple TV players. Mirfield Free Grammar School’s Tim Wilson said, ‘Pro Audio Systems provided the complete professional solution that we were looking for. They were quick to respond to our initial request with a full quotation that they happily tweaked to exactly suit our requirements. Installation was carried out soon after with a minimum of fuss, and the completed systems have impressed both our staff and clientele. I would absolutely recommend them to anyone considering using their services and they will be my first choice for any future projects’.